AZUSA, Calif. -- A tanker truck overturned Wednesday on the Foothill (210) Freeway in Azusa, spilling about 1,000 gallons of liquid asphalt, prompting closure of all eastbound lanes and some transition roads and onramps for about 11 hours. The accident was reported at 5:41 a.m. on the eastbound 210 Freeway at Azusa Avenue, said California Highway Patrol Officer Jennifer Connolly. No one was hurt, she said. The tanker truck was carrying a 50,000-gallon load of liquid asphalt, and about 1,000 gallons spilled, said county fire Inspector Sam Padilla. 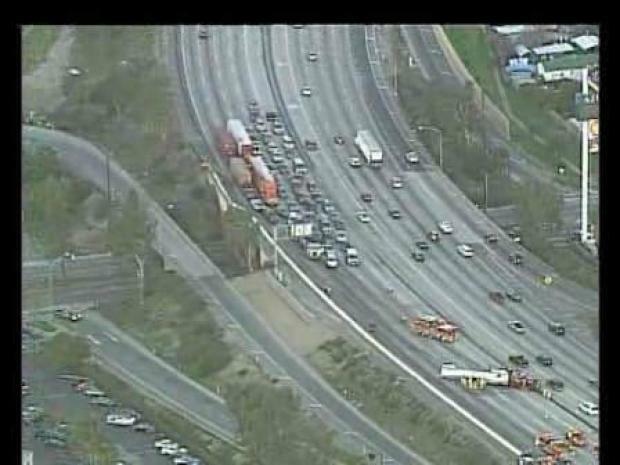 Crews worked to clear the scene, but a huge backup developed on the eastbound 210 Freeway. Traffic was also congested in the westbound lanes. A tanker crashes and spills liquid asphalt on an Azusa freeway. Shortly before 5 p.m., three lanes of the eastbound freeway were reopened. The carpool and one other lane remained closed. The transitions from the San Gabriel River (605) Freeway to the 210 Freeway, as well as the onramps to the eastbound 210 Freeway from Irwindale and Vernon avenues were also re-opened. No cars were hit during the accident and no injuries were reported.